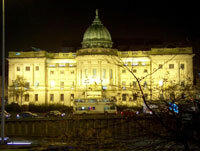 The Mitchell Library is one of Europe's largest public reference libraries. Since it was opened in 1877, the Mitchell has acquired approximately 1.3 million items. The Mitchell Library boasts many exceptional items, rare books and manuscripts, including over 4,000 works by Scotland's National Poet Robert Burns - the largest collection of Robert Burns in the world. Adjacent to the Mitchell Library is the well-known Mitchell Theatre, a popular venue highly regarded by the city's culture lovers.